Special discounted price for July departure! These literary vampire tours Romania Dracula Tour departing from Bucharest are intended to Dracula novel's enthusiasts, culture and history fans, adventure seekers. 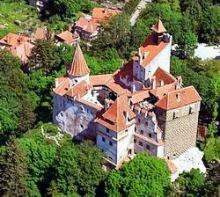 These vampire tours Romania also includes the most important historical places related with Vlad the Impaler such as: Snagov Monastery where, Vlad was buried after his assassination; Sighisoara - Dracula's birth place, Dracula’s Castle in Borgo Pass, built according to Bram Stocker’s imagination and the legendary Bran Castle. Book now vampire tours Romania discounted prices! We also accept payments via PayPal (by credit card, Visa, MasterCard, American Express, Discover or PayPal account), bank transfer and Western Union.